Edward Joseph Palkovich, 90, of Windmill Lane, Stuarts Draft, died Tuesday, October 21, 2014, at Augusta Health. He was born May 1, 1924 in Summit Hill, Pa., a son of the late Paul Palkovich and Anna Marek Palkovich. Mr. Palkovich graduated from Coaldale High School in Pennsylvania and Susquehanna University. He was on the track and football teams. He was inducted into the Pennsylvania Sports Hall of Fame in 2012 (Carbon Co. Area Chapter). He was a member of Phi Mu Delta Fraternity. He served in the Army Air Force in World War II in search and rescue in the South Pacific and Japan. 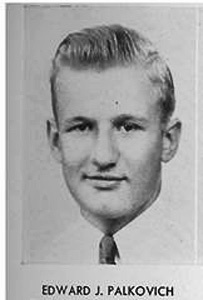 Ed was preceded in death by his parents; infant brother, Jan Palkovich and a sister, Helen Palkovich. Edward married Margaret Ungvarsky in 1958. They lived and worked in northern New Jersey until 1993. Ed retired from Powertech in Mahwah, N.J. as a sales and service manager. Upon retirement they relocated from Pines Lake in Wayne, N.J. to Stuarts Draft. Ed enjoyed hosting many Staunton Braves baseball players as well as exchange student Peter Korcek from Slovakia. The latter led him to the discovery of cousins in Slovakia. Ed was a member of St John Evangelist Catholic Church where he served as an usher and greeter, a service he greatly enjoyed. A Mass of Christian Burial will be celebrated 11 a.m. Monday, Oct. 27, 2014, at St John Evangelist Catholic Church by Father Rolo Castillo. Burial will be in St. Mary's Cemetery in New London, Conn. where family are buried.